Tobacco stocks have historically been a dependable source of generous and growing income, plus solid long-term total returns. However, not all cigarette stocks are created equal. In 2018, Vector Group (VGR) has seen its stock price plunge nearly 50%, worse than its major tobacco rivals (shares of Altria and Philip Morris have lost 23% and 19%, respectively). Vector's Dividend Safety Score has remained in our "Very Unsafe" category for more than a year. With VGR's dividend yield nearing 14%, its highest level in more than two decades, let's evaluate if a dividend cut could be on the horizon to end the firm's 20-year dividend growth streak. These harsh regulatory measures are merely adding to the major secular trend of declining smoking rates which hit 14% in 2017, and just 9% among high-school-age Americans. The chart below shows the U.S. adult smoking rate from 2006 to 2017. The FDA's harsher regulatory measures are designed to achieve a 12% adult smoking rate by 2020, and the current data and trends indicate they might surpass that goal. In this highly challenging industry environment, you have Vector Group, which is America's fourth largest tobacco company. 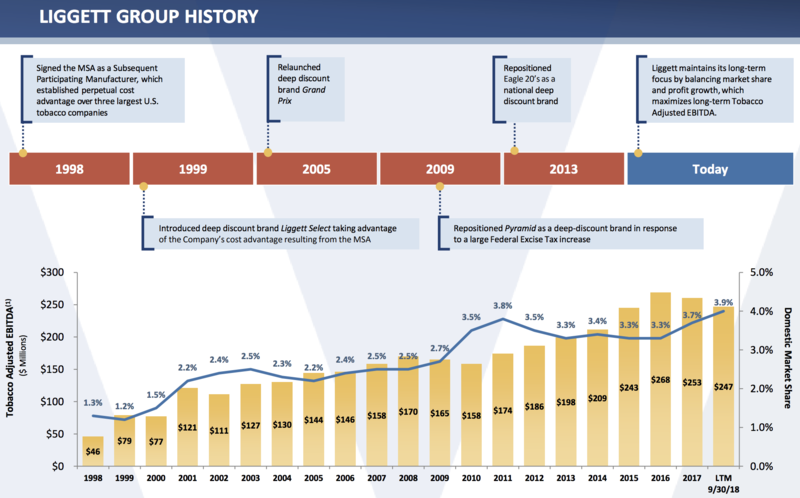 The firm is focused on discount cigarettes where its Pyramid, Grand Prix, Liggett Select, Eve, and Eagle 20’s brands command just 4% of U.S. market share. Vector has also diversified into real estate via New Valley, a mini real estate conglomerate that owns 71% of Douglas Elliman, the third largest residential real estate brokerage in America. 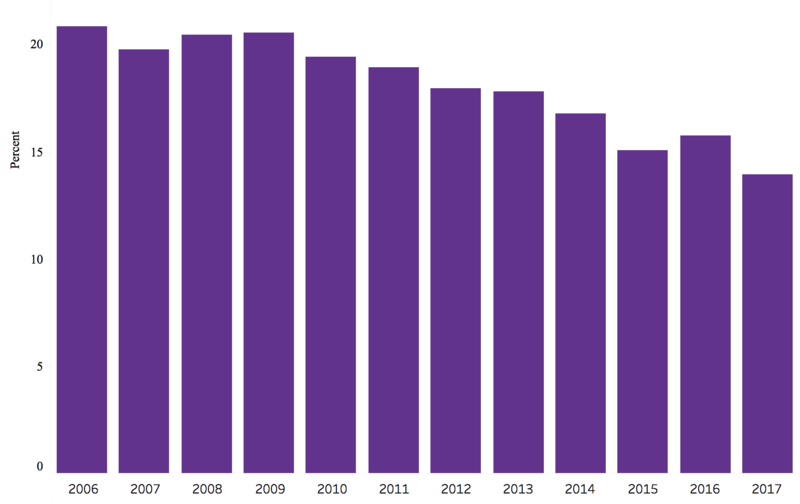 In total, tobacco makes up 59% of the company's revenue (down from 99% in 2000). Vector's business mix might at first seem appealing, given the secular decline in tobacco usage. However, note that tobacco accounts for 96% of the company's operating cash flow, meaning that the real estate business is not actually providing much bottom line diversification. What's causing Vector such trouble? Nearly all of Vector's real estate revenue is in the form of brokerage commissions which is a low-margin, highly competitive business. Despite steadily increasing the volume of deals closed, Vector's real estate profits have been steadily falling, due to rising pricing pressure from rivals. Even when the housing market was strong (it's now softening), Vector appears to have lacked a competitive advantage in that business. With new and existing home sales slowing, Vector's real estate profits seem unlikely to turnaround anytime soon and could even continue falling. In the tobacco business Vector is also facing a lack of pricing power, due to the discount nature of its products (it is a pure play discount cigarette company). Over the past two years, Vector's Liggett Group, which consists of its tobacco business, has managed to win market share, but only by competing on price. The end result has been steadily falling operating profits. And keep in mind that due to its low market share, Vector has a cost advantage of 70 cents per pack under the Tobacco Master Settlement Agreement (the firm has far smaller legal liabilities than the largest U.S. tobacco companies). Yet despite that apparent advantage, Vector's profitability remains lower than major rivals, and its operating earnings are now in decline. Vector has been raising its dividend for 20 straight years, which is why many income investors naturally assume the dividend is safe. However, in this case, the stock's extremely high yield should be a clear warning sign that the market expects a dividend cut. Vector's questionable dividend safety begins with its rather lumpy profits. 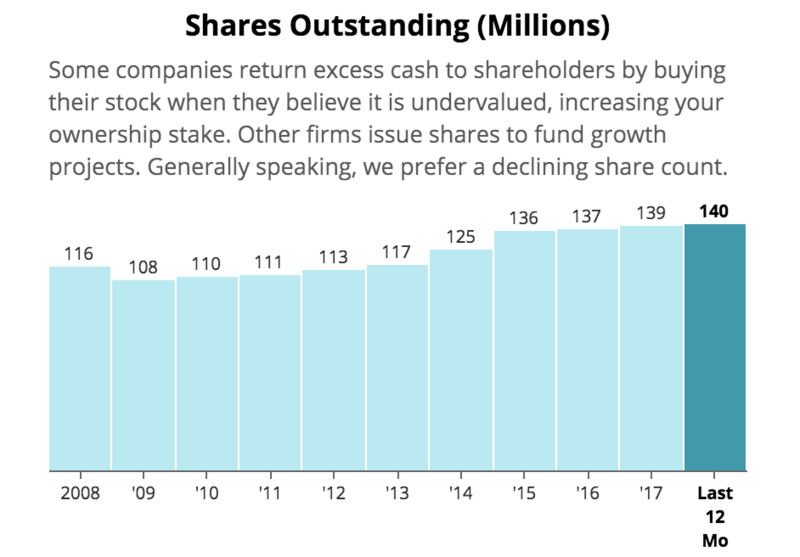 As you can see, the firm's earnings and free cash flow per share are neither stable nor growing consistently over time. The volatility is due largely to the lumpy nature of real estate profits which shows the downside of Vector's diversification strategy. Also not helping is Vector's 5% annual share dividend (sine 1999) which continually increases its share count, dampening earnings per share and free cash flow per share share growth, while also raising its dividend costs. Most tobacco companies have a policy of using their strong free cash flow to buy back shares over time, and thus allow for safer and more sustainable long-term dividend growth. Vector's policy is unusual, and its free cash flow margin of 13% is well below the 20+% level most of its peers enjoy (again due mostly to its real estate business). As a result, Vector's payout ratios, both on an earnings and free cash flow basis, are dangerously high and show no signs of trending toward safe or sustainable levels. Even if we ignore the company's investing activities, which reduce free cash flow and can be lumpy due to its real estate division, in 2017 Vector generated $132 million in operating cash flow, coming up far short of the $211 million it doled out in dividends. Seeking Alpha contributor Fishtown Capital, who is a family office principal with over 20 years of investment experience, wrote an excellent piece on Vector's debt profile and liquidity concerns that is worth reading here. Many of his insights are captured below and explain how Vector is increasingly challenged to fund its dividend. Simply put, the company has had to rely on drawing down its cash on the balance sheet (currently $364 million, down from $446 million two years ago), raising debt, and issuing new equity to fill the gap. While the company does have a lot of cash on hand to support the dividend, that figure doesn't account for the $130 million that Vector owes under the Master Settlement Agreement (MSA) through the first nine months of 2018. What's more, the MSA is based on market share, and due to declining industry volumes and Vector's victories in the price war on discount cigarettes, the company's market share is rising. Therefore, even if its overall tobacco volumes or revenue remain flat, its legal liabilities (a cash drain) could continue rising over time. In fact, the firm's year-to-date MSA liability is up 16% (about $18 million) compared to 2017. Should this trend continue, it will be even harder to maintain the dividend. Another way Vector has been funding the dividend is with ever higher debt levels. The firm's net debt to EBITDA ratio has swelled from 1.5 in 2013 to 3.8 today. For context, Altria and Philip Morris have net debt to EBITDA ratios of 1.2 and 2.3, respectively. Not surprisingly, Vector has a "B" credit rating which is firmly in junk bond territory. In fact, the company recently issued $325 million in new bonds (with very restrictive debt covenants) at a 10.5% interest rate. Vector's bond issuance was necessary due to the $207 million worth of 7.5% yielding convertible bonds that the company has coming due January 15, 2019. Those bonds are convertible into shares at a price of $13.80 or higher. The company took out that loan under the assumption that its share price would be high enough to pay the maturing bond in new shares. But with its stock price now plunging below $12 per share, Vector must pay the loan off in cash. After accounting for the MSA liabilities, doing so would almost entirely deplete the cigarette maker's cash reserves. "The terms of our 10.5% Senior Notes due 2026 contain covenants that place significant limitations on our ability to pay dividends and distributions in the future." The covenant Vector is most likely to breach (which would allow creditors to immediately call in the $325 million loan) is the requirement that its fixed-charge coverage ratio remains at 2.0 or higher. Today that ratio sits at 2.1, meaning that even a 5% decline in EBITDA would put Vector in violation of the covenant and likely create a liquidity crisis unless the dividend is cut or suspended. Vector also has $220 million more in convertible notes coming due in April 2020 ($22.35 per share conversion price). In other words, Vector is likely to have to continue tapping the bond market, at ever higher interest rates and with similar restrictive covenants, to pay off that loan as well. In fact, even factoring in the recent bond sale, Vector's next two years of debt repayments, operating cash flows, dividend costs, and working capital needs appear likely to leave it with less than $50 million in cash on the balance sheet. Or to put it another way, Vector could be headed for a brick wall composed of declining profitability, rising dividend expenses, and deteriorating access to capital. Should business conditions and capital market access not improve, the company's impressive dividend growth streak seems almost certain to come to an end. After all, bondholders, who are senior to equity investors in the capital structure, look increasingly likely to force a large dividend cut in the next year or two. Vector's impressive 20-year dividend growth streak has made it a favorite among many income investors. However, the company's attempts to diversify into real estate, rather than help it transition from tobacco, have instead resulted in a low-margin anchor that merely distracts management from the core tobacco business (which generates nearly all the cash flow). 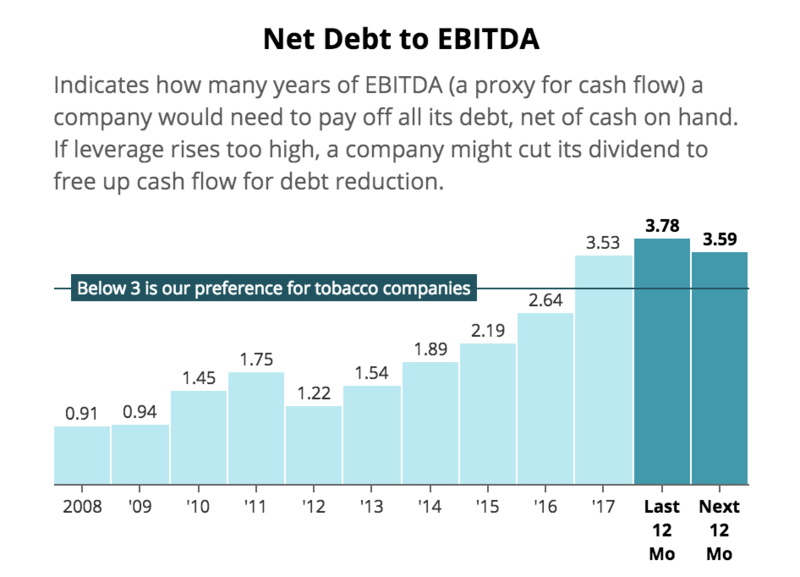 Given the ever-increasing growth challenges Vector (and the entire tobacco industry) is facing, the company's bloated balance sheet and increasingly desperate use of highly restrictive, high-interest junk bonds seem likely to result in a dividend cut in 2019 or 2020. Vector's deteriorating cash flow, rising dividend costs, and upcoming bond repayments are tracking to deplete the bulk of its cash reserve. Reducing the dividend would improve the firm's chances of remaining a viable business. Thus we continue to label Vector a "yield trap" to be avoided.